Formula 1 games have always been a fairly serious affair with only a few games over the years leaning towards the 'arcade' spectrum rather than the simulation-heavy affairs we've become so used to. Of course, this is by no means a bad thing but racing games heavy on being a sim can be quite tough for the wider audience to get into. This is why F1 Race Stars, personally, is one of the biggest and best, on the Xbox, PlayStation or PC. If you've been out of the loop whatsoever, F1 Race Stars is essentially Formula 1 hidden in a Mario Kart cloak. It's over the top, it's silly, it's colourful and completely nuts but here's the most important part of the puzzle - it's utterly delightful to play for plenty of reasons. Of course when you think of a go-kart game the obvious one is the eternally brilliant Mario Kart. You know, for a plumber who headbutts bricks and finds himself being sucked into pipes a lot, Mario's done pretty well to establish a series of karting games and Nintendo have done a remarkable job to make Mario Kart continually fresh and enjoyable over the last 15 years. Mind you, Crash Team Racing was always the one for me, again coming from a source that was a character known for jumping onto stuff and being a platform-genre hero yet managing to establish a legendary racing game. I think it's vitally important to establish one thing immediately though with F1 Race Stars - it is not Mario Kart or Crash Team Racing. There is no beating around the bush but this shouldn't be a bad thing necessarily - it offers its own slant on a karting game. What F1 Race Stars does so well is provide an accessible game that anyone can play immediately and jump into. There's some strange design choices and little flaws along the way, but ultimately it's an incredibly rewarding game to sit down and play especially with friends. Let me start with the flaws though as it's always good to get the bad out of the way. What seems so incredibly strange for a game that's FOM licensed and an official product is that it only comes with 11 tracks. The tracks themselves are based off circuits around the world but I'll come back to that in a bit - it just seems a strange choice of design to leave out a certain amount of circuits. As you play the game you'll see it's bustling with ideas so it doesn't seem as if Codemasters were short of inspiration. The drivers and cars all come officially licensed - it's incredibly odd to play such a cartoon-heavy game with official brands and advertising on the cars or around the track though. Sometimes I found it a little off-putting because it seems out of place but at the same time I wouldn't ask for it any other way because you'd be taking a lot of the F1 identity away. Also the game includes a few generic characters that serve no purpose apart from being generic characters but I suppose their inclusion is to allow female players to have a female character. Still, there's always Nico Rosberg and his dashing locks. As with all karting games too it's essential to play it from a multiplayer perspective. There's nothing wrong with the single player aspect of the game - there's 40 different championships to win in the format of what you would see in the Mario Kart cups - but this is most definitely a game to be playing with your friends and family. Personally it's still enjoyable in single player and has plenty of content to keep me happy but I can certainly see people getting a bit tired if they don't have the opportunity to play with others, especially with the fairly small track selection. Despite the lack of numbers in tracks, the actual design of the circuits themselves can't be faulted as the track design is brilliantly done. Each one is very loosely based off the real life track for the country involved but soon goes off into tangents full of loop the loops, split roads, shortcuts, swirling roads going every direction under the sun, flying sections and just everything you'd expect from a karting game but never from an F1 game. My personal favourite is the Abu Dhabi track being based around the Ferrari World rollercoaster, although Brazil's travel through samba paradises and jungles is worthy of a shout too. There's so much variety and personality to them that Codies have done a cracking little job at making the tracks feel different and utter fun to blast your way around. Furthermore, it looks fantastic and a lot of effort has gone into the look of the game itself with the cartoon heavy graphics and mini-F1 drivers all fitting in perfectly with the whole atmosphere of the game. It's Formula 1 like you've never seen before and that is most definitely a good thing. So how does it feel to actually play, you may ask? One thing you'll notice immediately is that drifting is a no go in F1 Race Stars which is a fairly brave choice of design for a go kart game. Drifting is synonymous with any type of game in this genre of racing but, as far as I can tell, it's not been including to give the karts that 'F1 car' type of feel to them. This is one thing I think one person will love and the next person will hate but I admire the fact they've made a choice like this and still left the game feeling like an over the top karting game. Cornering at first felt quite difficult but the more you get used to it the better it gets. The power-ups and little features littered around the track all hark back to F1 rules and events and are pretty cute in their execution. You have the standard power ups - bubbles hitting the car ahead, a bubble going to the leader to slow them down, the normal kind of cliché inclusions - but then you have the Safety Car power-up which brings out a mini safety car to back the field up, or a rain power-up that unleashes the heavens on everyone else except yourself and it's these little things along the way that remind you it's still an F1 game no matter how alien it may seem for such a strict license! Races consist of 12 players all battling it out with all the various power ups mentioned and shortcuts and little bits going here and other bits going there and it all holds together very well. Technically I've had no issues with the game and the races have always been great fun to play. Don't get me wrong - there will still be moments where it will drive you mad as it screws you out of a victory at the last corner on the last lap but isn't that what games like this are all about really?! It's worth giving credit to FOM for allowing the actual Formula 1 license to be used so loosely like this and for Codemasters to offer such a fabulous alternative to the casual fan of F1 or just someone who wants a fun karting game to play. There's so much going for F1 Race Stars - the enjoyable tracks, the colourful aesthetic, the accessible gameplay - that it would be ridiculous to simply ignore it because it looks cartoony and looks silly. These reasons are precisely the reason it's worth giving it a look! Admittedly one thing I absolutely cannot understand is why a game like this, so well suited to the whole family to enjoy, wasn't released in any form for the Wii or even the new Wii U considering Nintendo's core audience being the whole family and how many people own a Wii. I guess some things make no sense but it seems a game absolutely perfectly inhabited for the Wii. All the same, if you or your family have a PlayStation 3, Xbox or PC and are looking for something everyone will enjoy this Christmas you'd be mad to not give F1 Race Stars a gander to sit for someone under the Christmas tree. It may not quite reach the dizzy heights of Mario Kart but it offers something that's never really been brought to the table for F1 fans whilst doing so very, very well and makes for a lovely gift for anyone in the family. Importantly F1 Race Stars is not just a lazy rip off which is essential to making a game worth playing but not leaving you sour in the mouth thinking it's just a Mario Kart clone. What it does it most certainly does in its own right. It brings the world of F1 much further back to earth than any kind of simulation game can, simply because it's so ridiculous and silly but more so because anyone can play it and not have to spend a stupid amount of time getting used to it if they're not a big gamer. 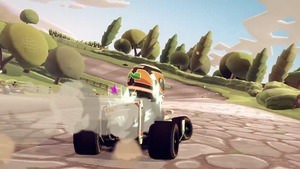 Plus it has cartoon Formula 1 drivers - what more could you ask for?